activity-dependent synapse formation, leading to self-organization of neuronal connectivity (Katz & Schatz, 1996; Durand et al., 1996). As a core project objective, we will develop a physical memristive component capable of supporting, at an elementary level, different forms of short- and long-term synaptic plasticity thus reproducing what happens in a real synapse (Fig. 1). Figure 1 . 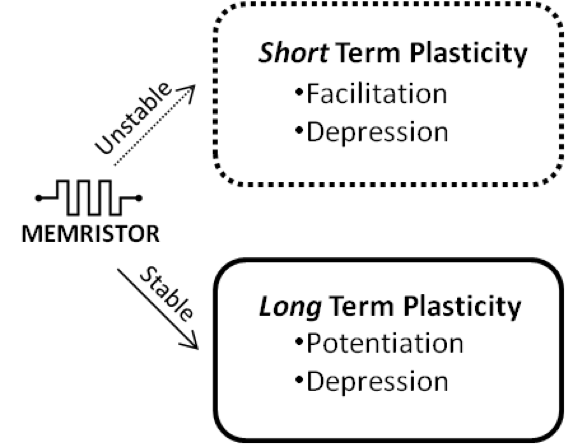 Forms of memristive plasticity. Different forms of synaptic plasticity will be emulated using a memristive physical component that will be operated at different stability states in combination with nano-scale CMOS circuitry . Biological synaptic counterparts of Aplysia and rat hippocampal cultured neurons will coexist in the biohybrid generating a new form of plastic communication between natural and artificial neurons. The RAMP system, which will be realized by growing Aplysia and rat hippocampal neurons on a silicon microchip as a substrate, will provide new and unique adaptive, self-organizing and evolving properties deriving from the fusion of natural and artificial neuronal elements into a new ‘plastic’ entity. As such, the evolutionary and plasticity characteristics of RAMP will be investigated and assessed towards the end of this project. This approach seeks developing a technological platform that will boost research and development in cross-disciplinary areas such as brain-inspired computation, neuromoprphic engineering and neurobiology. In addition, it will represent a fundamental step towards the creation of ‘autonomous intelligent systems’ for robotics applications and ‘intelligent’ neuroprostheses with a tremendous societal impact. In order to create the new biohybrid, we will progressively face throughout the project important challenges and reach several sub-objectives as summarized hereafter. Figure 2. Communication to natural neurons is established through physical micro- (nano-) electronics components. 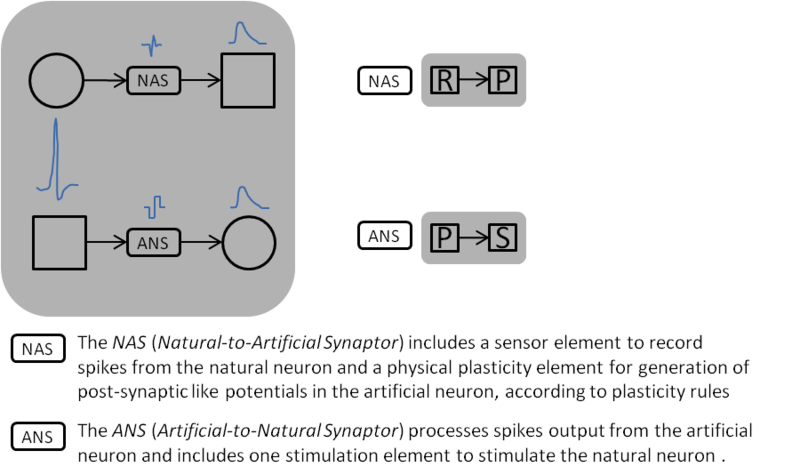 (a) The sensor element R (i.e. EOSFET) detects the neuronal action potential as a low-amplitude extracellular voltage signal; the stimulation element S (i.e. EOSC) is used to convert an input voltage signal into a modulation of the neuronal electrical potential, eventually leading to AP firing (b). 2) Development of physical components with plastic properties based on nano-scale memristors in combination with CMOS circuitry emulating the function of a biological synapse (Fig. 3). Figure 3. Memristive synapse. A physical plasticity component, P, is developed to emulate natural synapse behaviour. The new element will rely on nanoelectronic – CMOS circuitry including memristors as main components. This ‘memristive synapse’ will be engineered to transform spike inputs from a pre-synaptic neuron into post-synaptic potentials in a post-synaptic artificial neuron and will support short-term and long-term plasticity (including STDP). 3) Implementation of plastic communication in ‘monosynaptic’ biohybrid pairs of one natural and one artificial neuron. Shifting from hardware-only (sub-objective 2) to biohybrid natural ↔ artificial synaptic-like communication, the memristive plasticity element P is embodied in a new elementary synaptic-like unit allowing signal transmission between natural and artificial neurons. The new biohybrid signal transmission unit is named Synaptor. In the case of transmission from natural to artificial neuron, spikes of the natural pre-synaptic neuron are detected by a recording element and then fed, after processing, into the memristive plasticity component to elicit post-synaptic potentials in the artificial neuron. This type of unit is named Natural-to-Artificial Synaptor (NAS). An Artificial-to-Natural Synaptor (ANS) will also be implemented that will process spikes from the artificial neuron and stimulate the natural neuron by a transducer (Fig. 4). Short-term and long-term like plasticity will be supported both by ANS and NAS elements. It should be emphasised that, differently from the memristive plasticity element P, Synaptors are biohybrids responsible for ‘plastic’ signal transduction between the two worlds of natural and artificial neurons. 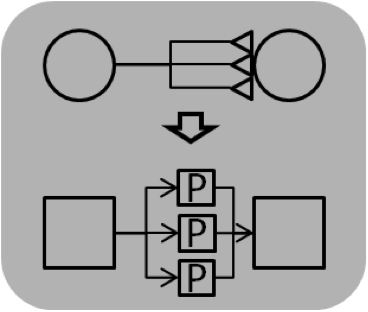 The Synaptors concept is outlined in figure 4. Figure 4. Synaptors. Schematic representation of signal transmission between artificial and natural neurons through ANS and NAS that are acting as ‘plastic’ communication links in the biohybrid. 4) Implementation of activity-dependent self-organization of connectivity in the artificial network as complementary mechanism to synaptic plasticity. Whereas the linking process occurs in the natural network depending on neuronal activity and spontaneous biological development, connectivity between neurons in the artificial part of the biohybrid will be driven by neurobiology-inspired algorithms. The number of connections between artificial neurons will be increased (or decreased) as a function of activity. The process emulates, at the very basic level, the formation of new synapses (neosynaptogenesis), which accompanies LTP in connected neurons after sustained and repetitive activation (Katz & Schatz, 1996; Durand et al., 1996) (Fig. 5). Figure 5. Emulation of activity-dependent neosynaptogenesis. In addition to homosynaptic plasticity, formation and stabilization of new connections between neurons is a second fundamental strategy adopted by brain circuits to select and pass relevant information. New connections are formed and refined by activity-dependent synapse remodelling, in which active synapses are preferentially stabilized at the expense of less active synapses to generate an optimal synaptic circuit supporting nervous system function. The mechanism is basically emulated in the artificial network through switch operated connectivity lines between neurons whose on/off states are controlled by appropriate algorithms. The artificial/natural biohybrid network, RAMP, is created (final project objective) and the new entity investigated with respect to adaptability, robustness, scalability and evolving properties in terms of ‘behaviour’ (e.g. autonomous generation of activity patterns) and ‘learning’ properties (e.g. recognition of spatiotemporal stimulation patterns).